The conventional wisdom of acne is that only cysts and papules leave scars. The worst thing that can happen in the wake of a whitehead or blackhead is an enlarged pore, most of us have been taught. But new research finds that skin-scarring lesions can arise from non-inflammatory acne and even from clear skin. 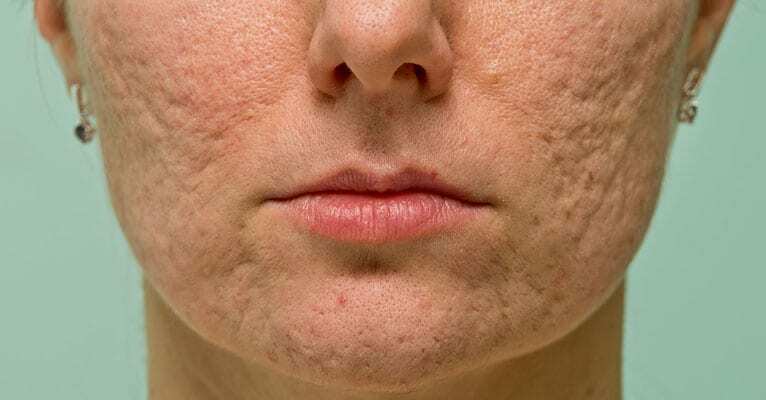 Pimples and other forms of inflammatory acne play a major role in skin scarring, but a recent study concludes that a majority of acne scars do not arise from inflamed skin. Scars can arise from non-inflammatory acne like whiteheads and blackheads. Dr. Sewon Kang, a research dermatologist and chairman of the department of dermatology at Johns Hopkins University in Baltimore whose work is partially funded by the skincare product make Galderma, made a 12-week study of the natural history of acne in 25 volunteers. He used computer-assisted spatial alignment and high-definition digital photographs to track acne outbreaks and skin damage leading to scarring. Kang’s 25 subjects collectively had 219 inflammatory lesions of the skin. Working backwards with the help of the serial tracking system, Kang determined that 41% of pimples started as blackheads or whiteheads. Another 13% of pimples developed in open pores, 6% developed inside existing scars, and 28% arose from healthy, normal-looking skin. Most of the participants in the study, 23 out of 25, had some degree of scarring at the end of the study. A little under 70% of scars were ice pick or indented scars, a little under 30% of scars were outward-protruding scars, and 2% of scars were what dermatologists call rolling scars. About 2/3 of the scars observed at the end of the study were not present at the beginning of the study, which suggests either that photographing the face causes acne scars (which is not very likely) or that many scars develop very quickly and resolve very quickly, in just matter of weeks. Even smooth skin, however, can quickly become scarred. Dr. Kang suggests that this is a reason for very aggressive treatment of acne. If smooth skin can become scarred by acne in just a matter of weeks, it may be a good idea to be very aggressive in keeping acne in check. Dr. Kang prescribes a combination of benzoyl peroxide to fight acne bacteria, antibiotics to get rid of the bacteria benzoyl peroxide does not kill, plus a retinoid like tretinoin topical to stimulate the production of collagen beneath the skin and to keep pores open. A combination of prescription medications, however, is not the only way to go. You would keep your pores open with a clearing tonic, preferably one that contains green tea extract. Green tea extract reduces the production of oil in your skin, keeping oil production to levels that lubricate the skin without filling pores. You would also remove excess oil from your skin with a cleanser once or twice a day. In combination with clearing tonics that reduce the production of sebum, the cleanser removes excess oil that may already be there. You would “calm” your face with a clear pore serum. Products that contain licorice extract help your skin conserve the steroids that reduce inflammation. They don’t introduce extra steroids to your skin that can cause loss of skin color. They just work with the steroids that your skin naturally produces. You would smooth away dead skin around tiny scars with a microdermabrasion cloth and a microdermabrasion scrub. The cloth contains polyethylene fibers that wear away dead skin that clogs pores and keeps new skin from emerging between pores. The microdermabrasion scrub contains corundum crystals with just enough sharpness to lift dead skin from the surface to give the skin below more “give.” This lightens fine lines and wrinkles and gives the skin more flexibility. It also brightens skin tone. You might also use a clarifying mask to “get the red out.” Masks feel good on the skin—and feeling good really does help you look good, because stopping irritation stops inflammation. Magnesium compounds in facial mask treatments get rid of redness, too. It also helps to use exfoliants that contain glycolic acid (if you have dry skin) or salicylic acid (if you have oily skin). They strip away dead skin, and they also stimulate the production of collagen beneath the skin. Extra growth in the basal layers of the skin may stop indented scars before they start. It can also help to make sure your diet includes enough protein and vitamin C. The amino acid that they skin uses to make the collagen that fills in scars is hydroxyproline. It’s abundant in foods like Jell-O (jelly or gelatin) and stewed chicken and beef. This amino acid becomes the building block for strings or protein that make up collagen. Vitamin C is a cofactor for enzymes that help the collagen “string” join into spirals, making the skin much stronger and more resistant to scarring. About 500 mg of vitamin C a day, taken as an oral nutritional supplement, usually is enough to make a difference in the resistance of your skin to scar formation. It’s also possible to provide vitamin C to your skin by applying creams containing the ingredient ascorbyl palmitate, but the product has to be dispensed from a tube to keep oxygen in the air from destroying the antioxidants in the skin cream. Do not do just spot treatments for acne. It is important to treat pimples, but 70% of scars result from other kinds of blemishes or even form on clear skin. At the very least, keep your skin free of excess oil and moisturized with a non-alcohol moisturizer, and use the mildest benzoyl peroxide product you can find (2% to 2.5% benzoyl peroxide) to keep acne bacteria under control.